Winter in the Willamette Valley is just beautiful. Rumor is visitors will encounter rain and even more rain. And you might but what a sunny and gorgeous time of year especially for touring some of our finest Oregon wineries. Winter is typically not as busy as the summer months so you might have the opportunity to meet the winemaker or owner, learn more about the wines and why they taste the way they do. Some might even break out a library wine or take you to the barrel room. Many wineries are family operations giving you an opportunity to develop an intimate relationship of the entire operation. The innkeepers of the Oregon Bed and Breakfast Guild are amazed each and every week with its beauty, but it’s our guests sharing what they love about the Oregon wine country that seems to tempt us to sneak away now and then for a taste. And we do. The Innkeepers in the Willamette Valley of Oregon can direct you to their favorite winery, vineyard and tasting room. All for the love of good Oregon Wine. 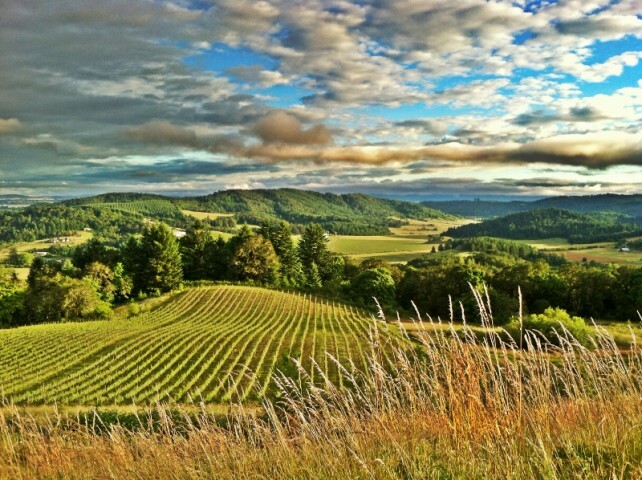 The Willamette Valley is also home to snowy mountain peaks, fine art, rich heritage and a delicious culinary scene. The many wildlife refuges provide opportunities to view the migratory birds such as the majestic Bald Eagle and the dusky Canada Goose. Winter rains fill the foothill waterfalls and rivers that flow under the Covered Bridges.